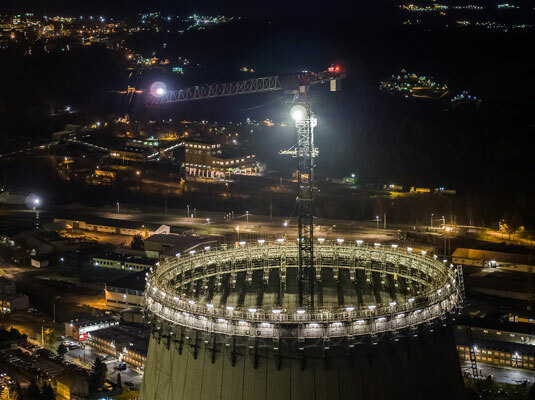 The Terex Application Engineering Team was able to solve this technical challenge quickly: The factory specialists developed a cable structure that would make it possible to anchor the crane tower to the cooling tower’s slab, enabling the CTT 332-16 to remain stable at all times. The first anchor was secured to the crane tower at a height of 62.40 meters, and the second at a height of 109.60 meters. This way, the Terex Cranes specialists were able to ensure that the CTT 332-16 flat top tower crane could efficiently perform all lifts with a jib length of 55 meters during every “growth stage”. The support provided by Terex Cranes went even further, however: Regional Sales Manager Bartosz Irzyniec offered Corleonis – as a kind of full-service offering – commissioning support by a field technician from the Terex Cranes plant in Fontanafredda. “Needless to say, it was the kind of offer that we wouldn’t have dreamed of passing up, especially given the fact that the crane model is still practically new for us. Basically put, the support provided by Terex gave us additional field experience,” reports Jacek Obrebski. Terex Cranes Service Manager Ivo Romanelli and Field Technician Mirco Manarin were responsible for this “extra field experience,” and in March 2017 not only assisted the Corleonis Team with setting up the crane at the work site, but also with commissioning, briefing, test lifts, and fine-tuning. During this initial stage, the crane was first erected to a height of 69 meters. This was followed by 110.40 meters during the second construction stage and by a final 151.70 meters during the third and final expansion stage, which was reached in November 2017. “The CTT 332-16 crane proved to be an absolutely reliable machine, showing once more that Terex tower cranes are literally a true giant in the EMEAR region as well,” Ivo Romanelli happily summarizes. Terex Corporation is a global manufacturer of lifting and material processing products and services delivering lifecycle solutions that maximize customer return on investment. Major Terex brands include Terex, Genie, Powerscreen and Demag. Terex solutions serve a broad range of industries, including construction, infrastructure, manufacturing, shipping, transportation, refining, energy, utilities, quarrying and mining.